Flooding will continue as crews work to restore power. Hurricane Florence weakened to a tropical depression over the weekend, but not before dumping historic amounts of rain on the Carolinas and knocking out power for over 1 million people. Along with first responders, utilities and clean energy companies are picking up the pieces as Florence moves northwest across the U.S. At least 17 deaths have been reported, a portion of a coal ash landfill has washed out, and flash flood warnings remain in effect for parts of North Carolina, Virginia and South Carolina. On Monday, several sources in the electric industry said they are still assessing the damage, even as floods are expected to worsen in the coming week. Ahead of the storm, Duke Energy, which has 40 solar sites in North Carolina, de-energized its arrays in the storm’s path, secured all equipment and stowed tracking panels in a horizontal position to avoid wind damage. As Florence moved onward, said spokesperson Tammie McGee, the utility remotely reconnected sites out of the path of the storm. According to McGee, preliminary checks on Monday indicated a positive outlook for the company’s installations. All solar taken offline during the storm was back online and providing power. During Hurricane Matthew in 2016, flooding caused most of the damage to Duke’s solar sites, but McGee said it is too soon to tell the impacts from Florence-related flooding. Dominion Energy and South Carolina & Electric Gas both said they did not undertake storm preparations on solar sites based on the storm’s forecast and projected path. SCE&G — which only owns one solar installation, in North Charleston — said that site “was not significantly impacted” and it had not heard reports of solar installation damage from third parties in its service territory. In the residential space, installers said initial reports also suggest minimal damage. NC Solar Now said on Monday that it hadn’t heard from any customers about damages. According to Wood Mackenzie Power & Renewables, NC Solar Now has the highest capacity of residential installations in North Carolina, at over 5 gigawatts. Yes Solar Solutions, which has 2,898 megawatts installed in North Carolina according to WoodMac, sent out a mass email to customers last week ahead of the storm asking them to power down systems and put Tesla Powerwalls in backup mode as a precaution. On Monday, CEO Kathy Miller said only six out of its approximately 800 customers had reported problems, all inverter-related. “If we had wind damage, we would already know about it,” said Miller, adding that further flooding could still impact inverters depending on how high waters rise. Those reports are consistent with impacts from past U.S. storms. Gary Liardon, president of the consumer division at PetersenDean Roofing & Solar, said issues that impact solar systems are mostly structural rather than related to the solar installation itself. Building codes require installations to withstand different wind levels based on location — 90 miles per hour, for instance, for Yes Solar’s installations in Wake County, North Carolina — and a variety of environmental factors. According to Liardon, design and attachment methods vary if you’re building in San Diego or Fresno. “Those designs look differently in terms of the attachment method, the size of the rails used, the space in between contact points in the roof — all based on wind requirements for wind jurisdictional regions,” he said. But even if a system can withstand severe weather, disrupted power lines can make a solar system useless after a storm because most are grid-tied. Recent storms have made battery storage an increasingly enticing option. Liardon said half of PetersenDean’s California solar installations in the last six months have included storage, a figure that stood at 5 percent or less just a year ago. That trend may soon pick up in the Carolinas. Through the weekend, Miller at Yes Solar said she had received several inquiries about Powerwall installations. Since October 2017, the company has installed between 20 and 25 storage systems. Disaster applications have become something of a niche for Tesla after it latched onto the crisis in Puerto Rico post-Hurricane Maria. Ahead of Tropical Storm Lane, the company rolled out Storm Watch in select regions including Hawaii. The feature triggers Powerwalls to charge to 100 percent as an extreme weather event approaches. As Florence moved toward the Carolinas, the company offered free supercharging and unlocked battery capacity in its vehicles. According to Miller, recent communication with Tesla indicates the company expects more Powerwalls to be available in 2019. For now, though, customers without storage will have to wait on the utility. Of the 16 million electric customers in Florence's path, over 500,000 in parts of all three states remained without power on Monday, according to the Energy Information Administration. North Carolina was reporting about 450,000 outages. Edison Electric Institute said late last week that over 40,000 workers were ready to help with restoration and mutual aid crews are already at work. 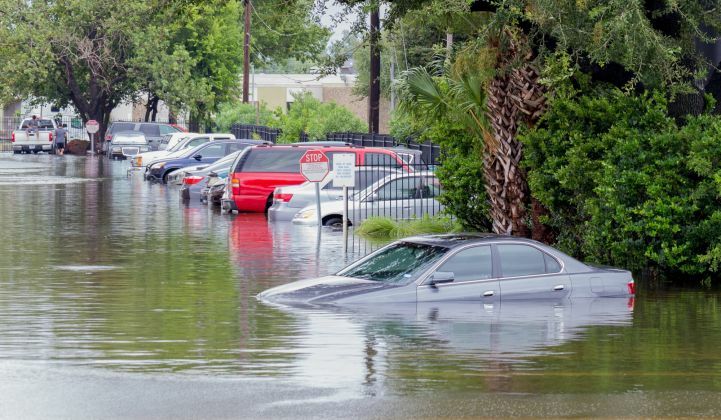 The National Weather Service on Monday said flash flooding would continue over the Carolinas. Because of those warnings and ongoing damage assessment, several sources said the impacts on electricity and clean energy generation remain in flux.